Shades of Night . . . The untended tree pits and other neglected outdoor corners of the West Village have gone green despite a very dry start to the 2010 summer season. There are various crab grasses and broadleaved ruderals such as plantains and lambsquarters to be found sprouting from these marginal patches. Another green citizen has also emerged en masse. This one stands vigorous and leafy and grows into a small bush that reaches a height somewhere between the knee and the waist. Colorful egg white blooms with projecting egg yolk stamens cluster beneath the shade cast by its alternating fuzzy leaves, blooms that turn into round green fruits that resemble unripe cherry tomatoes, one of summer’s favorite salad vegetables. Could it be? NO! This one is NOT edible, although the tomato comparison is astute. 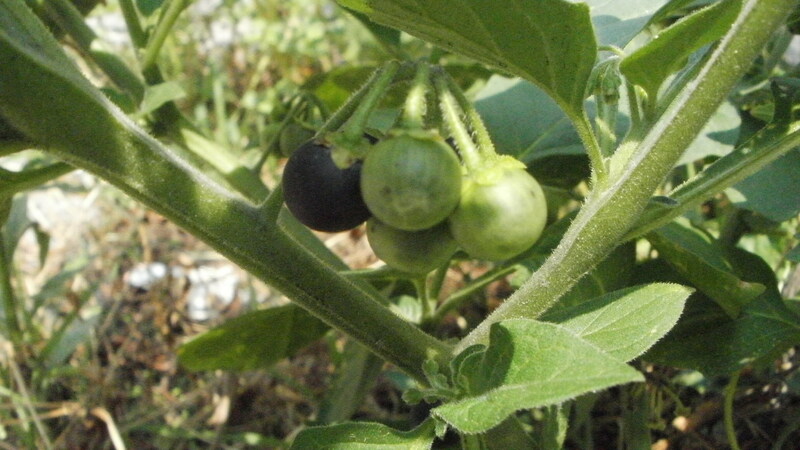 This plant is a member of the same broad family – Solanaceae – that includes the pretty petunia, the controversial tobacco, and the tasty potato, pepper, eggplant, and tomato. Welcome to the wide, inclusive household of the Nightshade family. 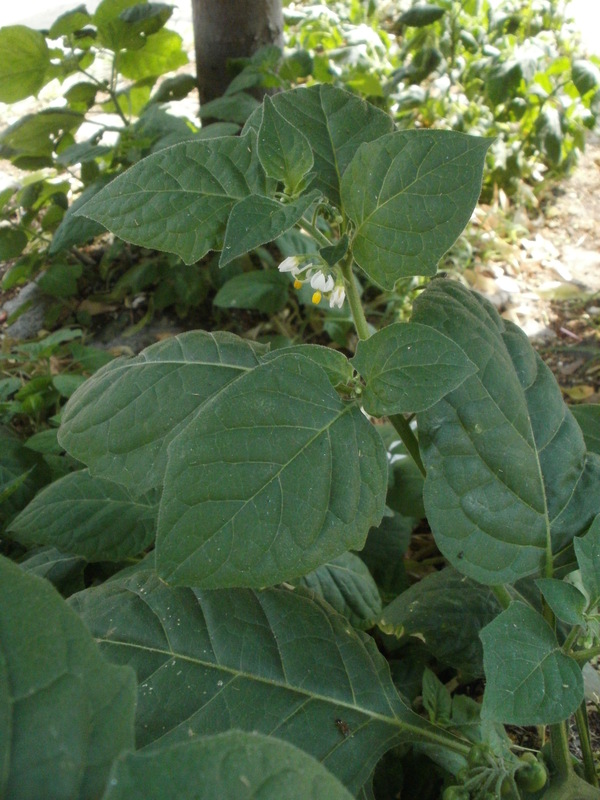 The specific specie that appears by July all around the West Village neighborhood is the American Nightshade, Solanum americanum. A handsome annual when found in small numbers, it could be foreseeably cultivated in an adult garden, one tended regularly and free of casual contact with children and pets. The leaves are deep green and ovate in shape, forming an alternating pattern along strong hairy stems. 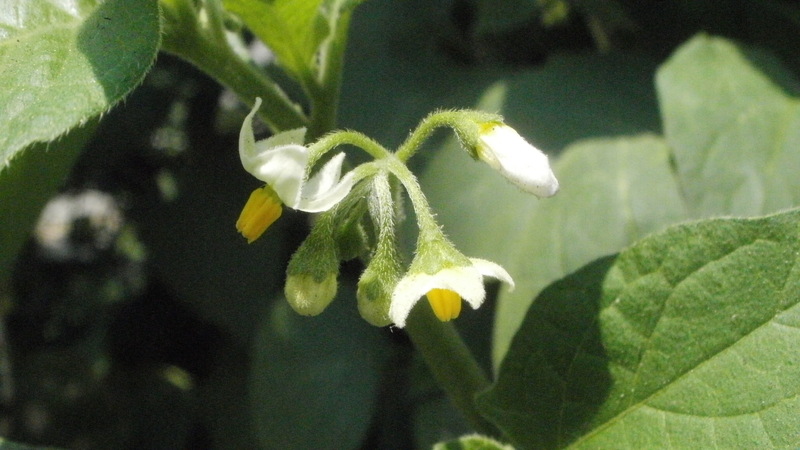 The flowers resemble the tomato’s bloom except that the egg yolk coloration is limited to the stamens, which project in such a way that if the flower is viewed in profile, right side up, the shape brings to mind a manual citrus juicer. The berries that emerge from the spent blooms do resemble miniature tomatoes. Their poisonous nature comes from a variety of glycoalkaloids. All of the numerous nightshade varieties that are not cultivated as common vegetables share this toxicity. Their sheer number can also cause confusion in the identification. The immature berry and the underside of the leaf provide the two easiest identifying marks of the American Nightshade. The unripe green berries sport tiny white freckles and the underside of the leaves are not tinted toward the purple end of the spectrum. When I was a boy, I became fond of this plant’s tomato-ish aroma, which grew to become one of my signature scents of summer. The overgrown lots and hillsides upon which my friends and I played and explored were often covered with the plant. The berries, full of minute seeds, turn a deep purple when ripe. These made excellent ammunition for epic “berry fights” that would later make our mothers weep or curse, depending on their general mood. The stains the nightshade left behind were more tenacious than even the mulberry. Poisonous, yet pretty, and also very, very hardy, the American Nightshade is a native citizen of the West Village (and of all the Americas), one that should be appreciated, as much as respected, from a distance. Ron, Your posts are always a pleasure to read. Do you have Passion Flowers where you live? They are in bloom here now.